Long ago, before Spanish wines were common on American restaurant menus, Tempranillo was not widely planted in the La Mancha region. combined with the perfect soils would make excellent planting grounds for the Spanish grape. In 1986, Valentin Diaz became one of the first winemakers in La Mancha to focus on Tempranillo. Others followed and the DO’s vineyards fate would be sealed as one of the country’s top Tempranillo-producing regions. Tempranillo represents 12 percent of the total grape plantings in La Mancha. But Valentin Diaz was instrumental in more than just Tempranillo. 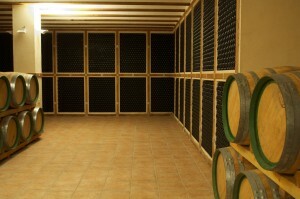 With white wines, he was also one of the first to conduct cold skin maceration and fermentation in casks. Today, Valentin Diaz’s so-called Allozo Project stands as one of La Mancha’s greatest wine achievements of the past 50 years. His Bodegas Centro Españolas has won Gold Medals at the Vinexpo, the Brussels World Contest and London Wine Trade Fair, as well as dozens of medals at other prestigious events. About 65 percent of Allozo wines come from Bodegas Centro Españolas’ 243 hectares with the best estates being located in Aldoba, Loma, Los Frailes, Pinilla, Huerta El Juez, El Duende and Rufinillo. The Crianza wines are aged in 3,000 American oak barrels and 500 French oak barrels. Allozo wines are 90 percent red, 8 percent white and 2 percent rose, with 70 percent being exported to 30 countries. Bodegas Centro Españolas also produces a lovely brandy under the Casajuana label. Casajuana brandy comes in Reserva, 25-years-old and 100-years-old. The Reserva label features a young woman running in the middle of the bottle. That is Valentin Diaz’s daughter, who is an Olympic sprinter. Like the wines, the brandy boasts a simple clarity, while at the same time being uniquely complex and delicious. Yellow color with a bouquet of grass, buttery richness and white fruits. Its fresh palate is filled with peach, apricot and citrus. This is a wonderful serving wine with fish and light pastas. Cherry color and intense red fruit aromas, this young wine shows a dry, balanced wine with nice structure. It’s fruit-forward, with rounded tannins, and hints of black pepper and blackberry jam. A lovely pairing with roasted meats, especially pork tenderloin. For an area not known for its Merlot, this La Mancha Merlot is a good example of the terroir’s potential. It’s deep cherry red color with purple trimming walks you right into a wonderful nose of ripe red fruits. It’s fruity mouth complements a balanced, simple wine. This Merlot is meant to be enjoyed now. Aged in American and French oak barrels for 24 months and 36 months in bottle, this 100-percent Tempranillo, lovely dark red cherry color wine is complex and proves the winemaker was on to something when he started planting Tempranillo. It’s big, intense, complex and elegant with spices, ripe black fruits and balanced with acidity and well-rounded tannins. This is the perfect wine for anybody wanting bold, but without the high-alcohol. It’s only 13 percent alcohol. With deer hunting season right around the corner, this is the ultimate wine to pair with game meats or lamb.